An affordable way to enjoy the rustic beauty of timber with our Ecowood range. Ideal for areas high in heat and moisture. 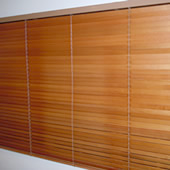 These PVC free slats are satisfaction guaranted against fading, yellowing, warping or bowing. Our Ecowood blinds are very easy to use and come fitted with a cord locking device to position your blind at the point you desire. Our blinds come with two sets of cords, one set to raise and lower the blind and the other set to tilt the slats which adjusts the lighting to whatever you choose.